Watchguard Family of Firewalls and UTM Devices - Coates Consulting Ltd. 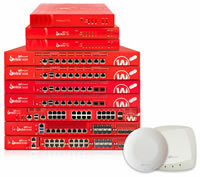 The range of WatchGuard firewall devices provide a cost effect and best in class security solution to businesses starting from a single user up to a large corporation. All run the same software and offer the same range of subscription services so no matter what size of business you have, WatchGuard has the security solution for you! The range is rated in many ways but one of the most important is by the internet speed that will be connected to it (throughput) and starts at the T10 rated at 90Mbs when all subscription services are switched on. The high end models like the M4600 are rated at more than 8 Gbps and are suitable for corporate headquarters. The Watchguard family is smart – it comes with knowledge about the internet and how to keep your business safe by examining every packet of data and applying rules to either allow or deny it. The subscription services add anti-virus, anti-spam and other services, getting rid of the internet nasties before they get inside your businesses network. APT Blocker uses a cloud-based sandbox with full system emulation to detect and block advanced malware and zero day attacks (additional subscription required). Data Loss Prevention (DLP) automatically inspects data in motion for corporate policy violations (requires additional subscription). Watchguard uses different best of breed companies for each of the services above. These include Trend Micro, AVG, Kaspersky, Websense, Cyren and Lastline.